The number of vulnerable Borders adults found to be at risk of harm following investigations by social work and health professionals fell last year. The annual report of the multi-agency Scottish Borders Adult Protection Committee (APC) for 2014/15 has revealed that 42 adults in that period were deemed at risk and had appropriate support put in place to protect them from further harm, compared to 62 the previous year. Of these, 10 had been subjected to physical abuse, eight had been subject to “neglect and omission”, five had been the victims of financial crime, five of the cases were described as “sexual” and three were the result of domestic abuse. Most harm took place in the adults’ own homes (20 cases) although 12 of the cases related to care homes. Among those responsible for inflicting the harm, 13 were family members and 12 were “paid professionals”. The report highlights a series of new bespoke training courses for managers and staff of the region’s 22 care homes to raise awareness of adult protection issues, encourage early intervention and build better communication with social work teams. 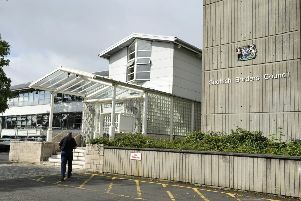 The 42 victims were distilled from an initial 1,432 reports which were received by the Hawick-based Adult Protection Unit in the year to March 31, 2015. From these, 169 were referred for investigation under legislation which defines harm as “physical and sexual harm, neglect, financial exploitation and harassment” and which seeks to protect adults, aged 16 or over, who, through disability, mental disorder, illness or physical or mental infirmity, are “unable to safeguard their own wellbeing, property, rights and other interests”. Of these referrals – from carers, family members, social workers and the adults themselves – 44 were in the 16-39 age-group, an increase of 20% on the previous year. “This increase suggests this group is involved in social media and smart phone technology and that an increased social circle leaves them more susceptible to harm from friends, acquaintances and relationships,” reported David Powell, adult protection co-ordinator. He commended work undertaken last year by SBC’s trading standards officers and the CAB in raising awareness among older Borderers who, with possible retirement settlements and lump sums, were particularly vulnerable to bogus callers and telephone scammers. There was no significant change in the number of referrals in the 40-64 age group (37 cases) and in the over 80s (57). Of the 169 investigations, 115 involved women, although Mr Powell notes this gender imbalance is mainly a factor after the age of 71 with women living longer on their own and at greater risk as their health deteriorates.